Today we will create a poster inspired by the all-known symbol, Ying and Yang. We will try to create the same balance from the sign in a more elaborate illustration. 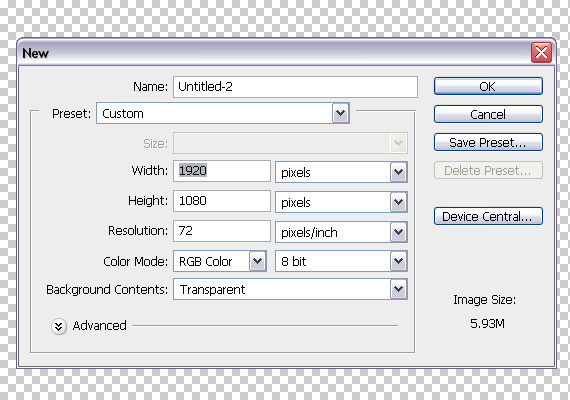 Create a new document of 1920×1080 px in RGB color mode at 72 dpi. I usually make it larger, because I can crop it later on. Open the â€œgirlâ€ picture. Go to Layer > Duplicate Layer (CTRL+J), then go to Filter > Other > High Pass. 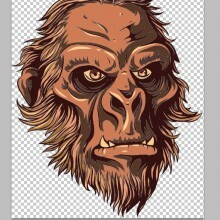 Set Radius to 1.1 px and hit OK.
Go to Window > Layers (F7) and set Blending mode to Overlay. Select all layers and to to Layer > Merge Layers (CTRL+SHIFT+E). Go to Channels window (Window > Channels) and click-drag the Blue channel onto the â€œCreate New Channelâ€ button. A â€œBlue copyâ€ channel will appear. Click it. 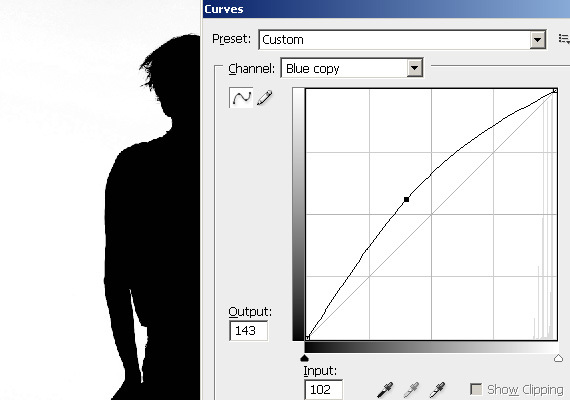 Go to Image > Adjustments > Curves (CTRL+M). Set the graph similar to mine. Repeat STEP 5 using an aproximate setting. The idea is to create a high contrast so we can load a precise selection from the â€œBlue copyâ€ channel. 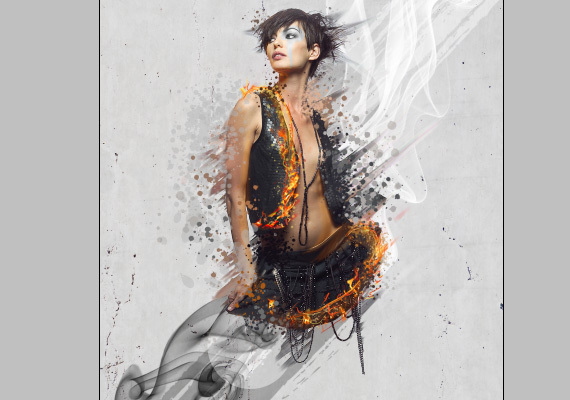 Grab the Brush Tool (B), press D to set Foreground to pure black and paint over the girlâ€™s body. Grab the Burn Tool (O), set it to Shadows and press â€œ0â€ to set it to 100%. Darken all the lighter areas on the girl. 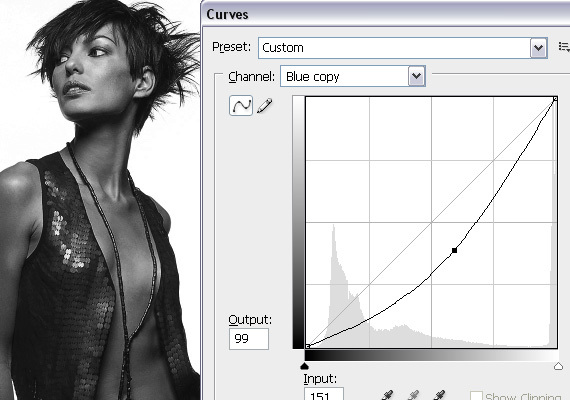 Go to Image > Adjustments > Curves (CTRL+M) and adjust the curve similar to mine. We do this to remove the light gray areas from the channel. In the Channels window, CTRL+click the â€œBlue copyâ€ channel thumbnail to load a selection. 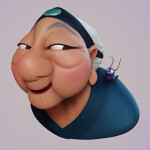 You will see a â€œmarching antsâ€ contour. Click the â€œRGBâ€ channel and turn off visibility of â€œBlue copyâ€ channel. 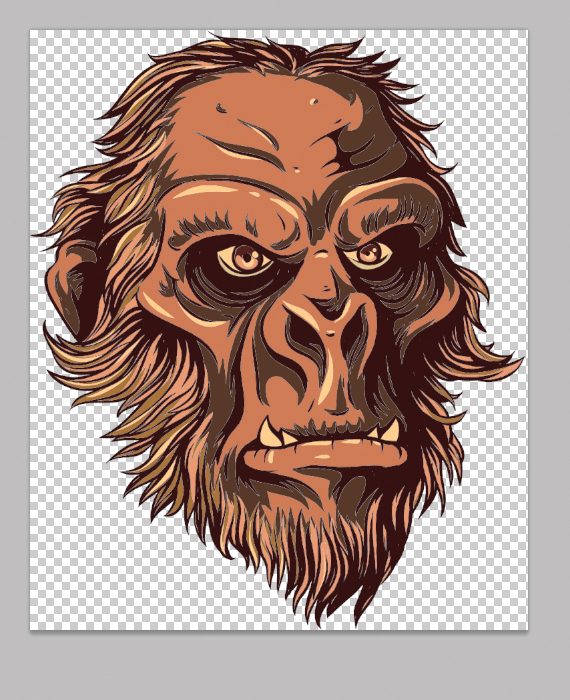 Double-click the layer thumbnail in the Layers palette (F7) and hit OK to make it editable. Hit Delete. Go to Window > Arrange > Cascade. Now click-drag the layer thumbnail into our document. Go to Edit > Free Transform (CTRL+T) to enter Transform mode and click drag one of the corners while holding SHIFT key to preserve proportions. Hit Enter. With this layer selected, go to Layer > Layer Mask > Reveal All. Now grab the Brush Tool (B), press D to set Foreground to pure black and paint over the girlâ€™s feet. Go to Layer > Duplicate Layer (CTRL+J). Do this twice. In the Layers palette (F7), select the original layer. 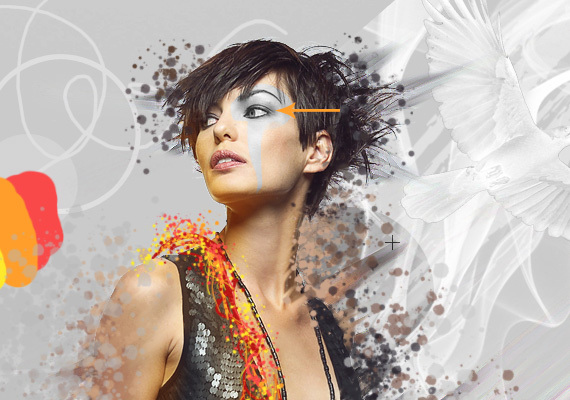 Now grab the Smudge Tool (R), set a round, soft brush and adjust Strength to about 60%. Start doing strokes on the edges of the woman. Try to maintain the same direction. Repeat STEP 15 for the second layer, but do a bit shorter strokes. Also reduce Strength a bit. 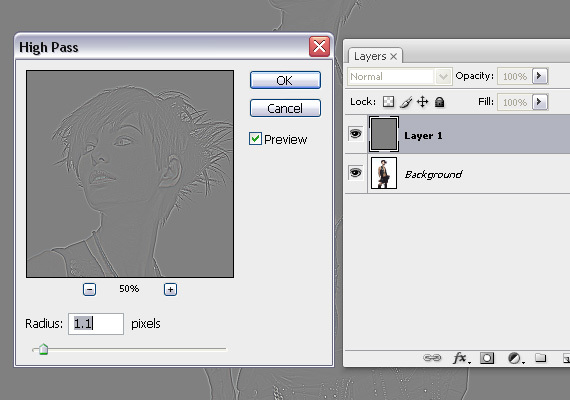 Go to the Layers palette (F7) and click the â€œNew Layer Groupâ€ button. Â Name it â€œgirlâ€ and click-drag all the layers with the girl in the layer group. 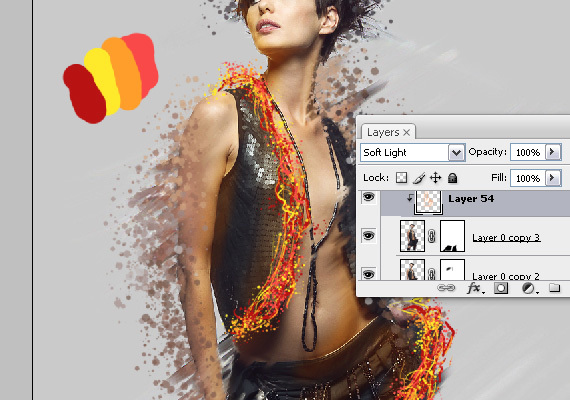 In the Layers palette, create a new layer above all the layers in the â€œgirlâ€ layer group. 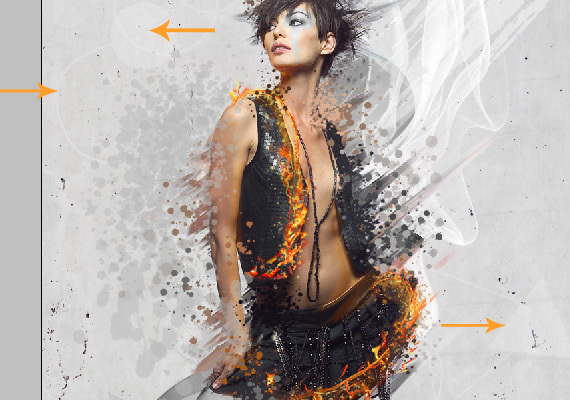 Open the â€œDesignious paint splash 1â€ brush set. Use settings similar to mine. Paint over the edges like I did. Simply hold ALT key to pick random nearby colors from the girlâ€™s body. 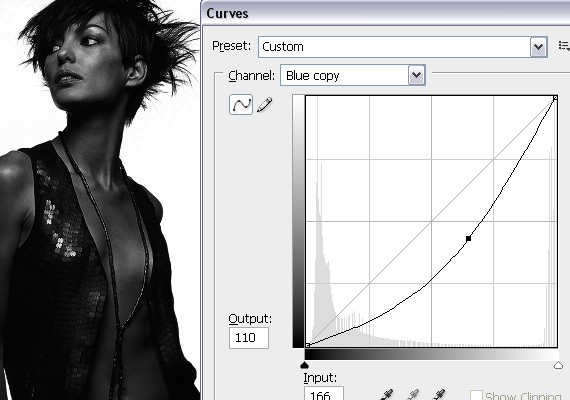 Also increase and decrease the size of the brushes using â€œ[â€œ and â€œ]â€ keys. Thereâ€™s no need to draw strokes, just click around or tap your graphic pen. Create two new layers above the splatters layer. Select the first one and grab the Brush Tool (B), set Hardness to 100% and paint three or four colors: bright yellow, orange, red and bright red. Decrease the size of the brush to 5-6 px, select the next layer above in the Layers palette (F7) and start painting random, curvy shapes. Use the dark red color â€“ pick it with ALT+click. Select the orange color and roughly try to follow the lines drawn with the bright red color. Do the same for the rest of the colors. This is how the final result should look like. Open the Brushes palette (F5) and change it to a splatter. Make a very small sized bush and as in previous steps, add random color spots of different colors. 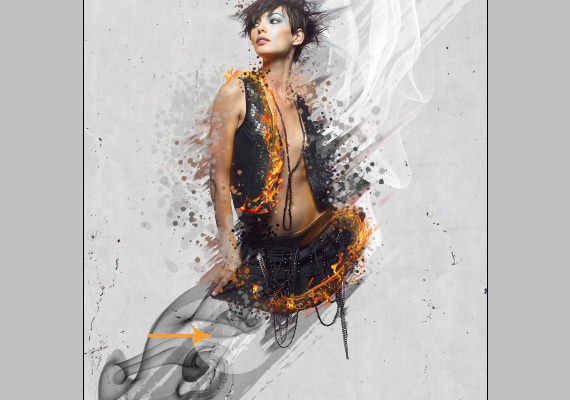 Create a new layer above the top-most layer with the girl and set Blending mode to Soft Light. 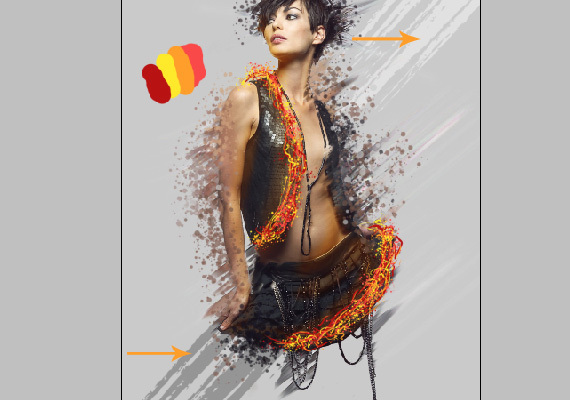 Then grab the Brush Tool (B) and pick the orange color (ALT+click), set Hardness to 0% and press â€œ5â€ to set the brushâ€™s Opacity to 50% and paint some bright lights on the girlâ€™s body. ALT+click between these layers when you are done. Create a new layer above the bottom-most layer. Name it â€œpaintâ€. 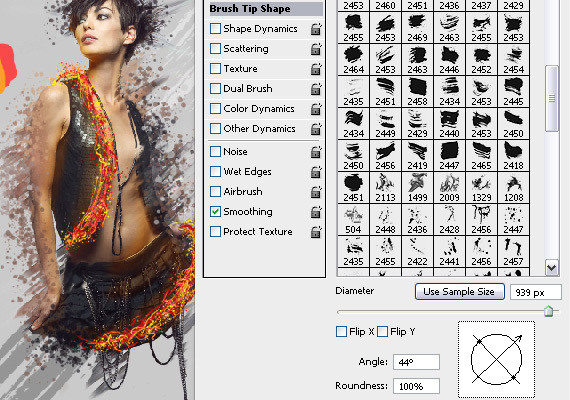 Open the â€œdesignious paint scratch pack 1â€, select a brush and use the settings below. Grab the brush tool and paint two brush strokes, one light gray and one midtone gray. Go to Layer > New layer. Name it â€œsmokeâ€. Use the same settings as with the paint brushes, hit D key and paint 2 smoke strokes. Grab the Ellipse Tool (U), click on the canvas and hold SHIFT key to draw a perfect circle. Give it a white color fill. Make sure it is set on Shapes. Set Blending mode to Soft Light in the Layers palette (F7). Repeat STEP 29,Â but use a dark gray color and set blending mode to Multiply. Create a new layer (CTRL+SHIFT+N). Now create white shapes of your choice: draw them, create random triangles, circles, squaresâ€¦ go wild! Set Opacity to 40%. Open the â€œbirdsâ€ .psd file, grab the Lasso Tool (L), select a bird of your choice, copy it (CTRL+C) and paste it in our document (CTRL+V). Also go to Edit > Free Transform to make it smaller. Hit Enter. Go to Image > Adjustments > Desaturate (CTRL+SHIFT+U). Repeat STEP 32, but this time go to Image > Adjustments > Invert (CTRL+I). 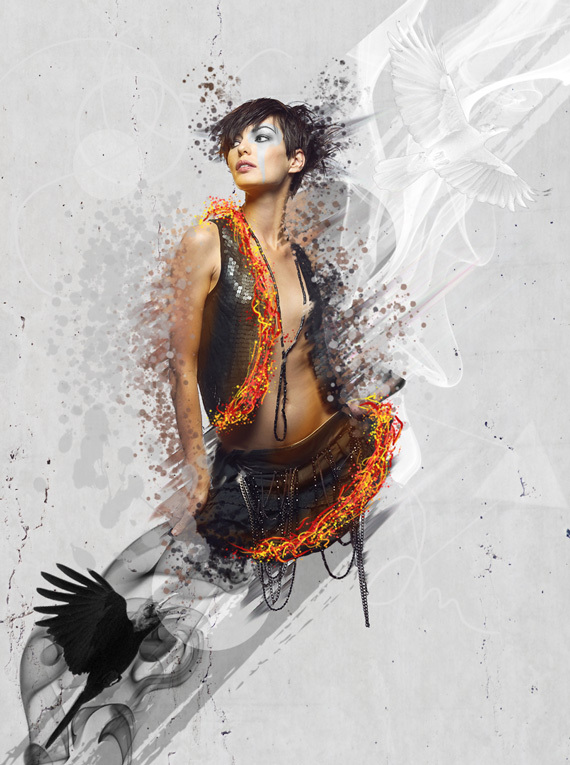 Grab the Dodge Tool (O), set it on Shadows with 25% Exposure and lighten the dark areas. Select the second copy of the â€œgirlâ€ layer. 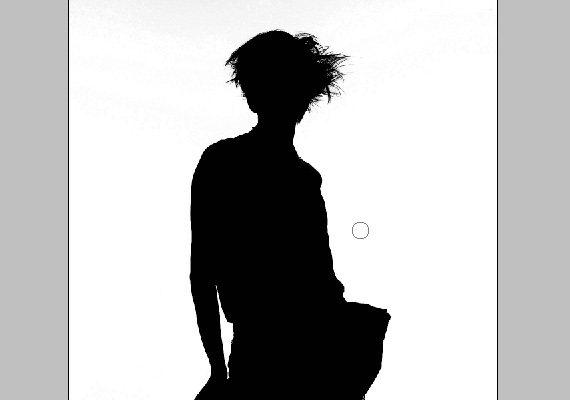 Now grab the Pen Tool (P) and draw a shape similar to mine and use white as fill color. 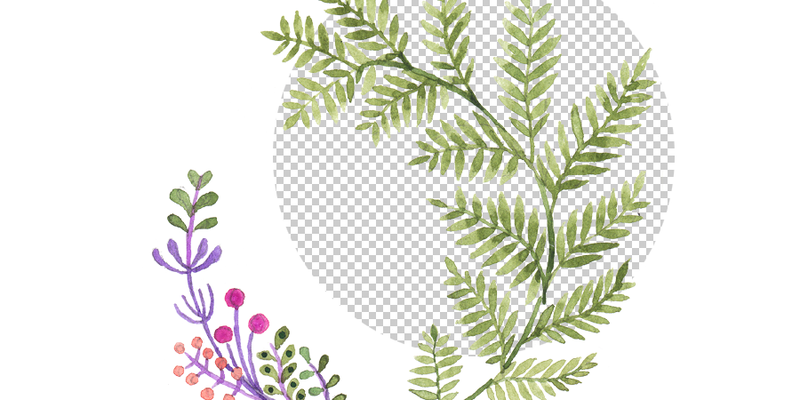 Set Blending mode to color. Select the bottom-most layer and go to Layer > New > Layer. Open the â€œconcrete textureâ€, select all (CTRL+A), copy it (CTRL+C) and paste it in our canvas. Resize it to fit and set Blending mode to â€œHard Lightâ€. 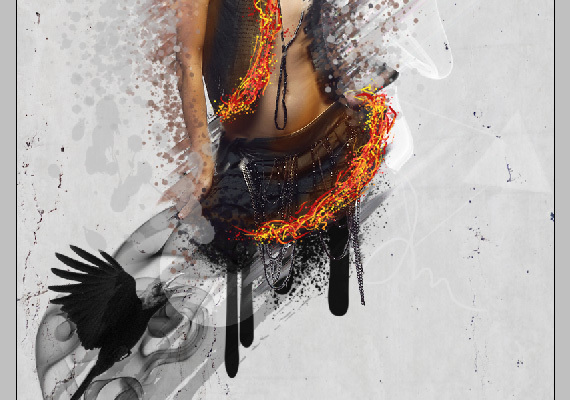 Create a new layer (CTRL+SHIFT+N), grab the Brush Tool (B), select a dripping splash and click under the bottom side of the girlâ€™s body. I write articles, Photoshop and Illustrator tutorials and draw pretty stuff for Designious, Pixel77 and Vectorious. I also drink and spill industrial amounts of coffee. Try using a similar stock photo, the effects applied are basically the same. If you need any assistance with the new photo, please ask in the comments. Thanks for the Great Post. Knowledge Plus is a Registered Training Organisation meeting strict nationally recognised quality control for Training and Assessment. Knowledge Plus has won numerous awards in recognition of their outstanding Customer Service. 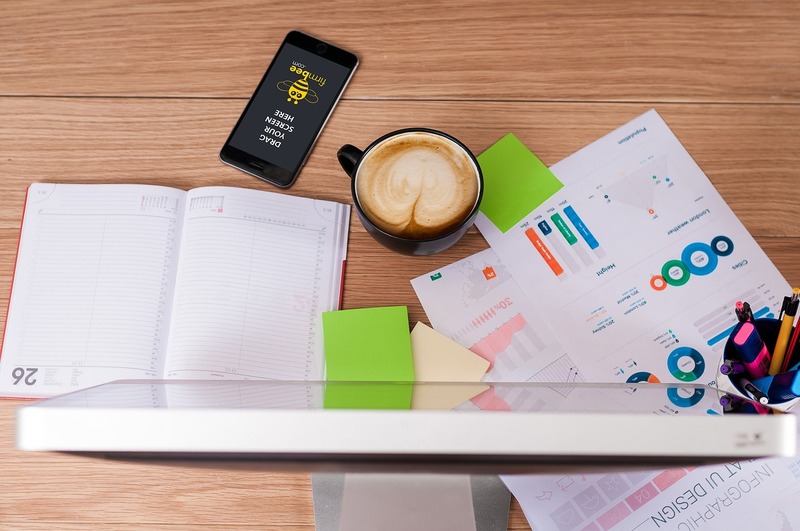 We specialise in Workplace-Based Training, Management Development, Change Management, Project Management, OHS and IT Training and have provided superior training to over 1600 professionals. 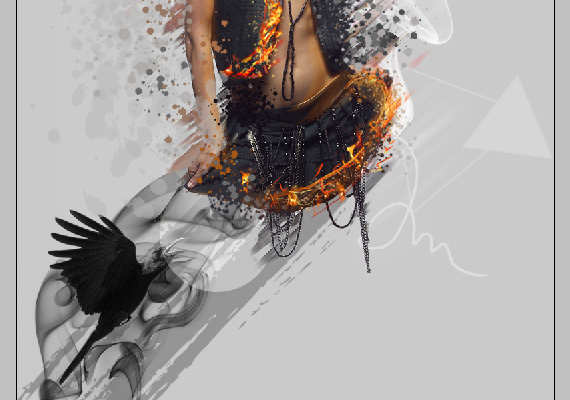 Although the art work is creative and very hard to do but with fantasy. A good presentation makes a hard thing easier to the viewers as this is. Really appreciate it.